One man must battle a group of ruthless terrorists holding hostages, including his wife, in a confined space. Wait - did we not see this movie before, back in 1988, under the name Die Hard? Cheap knock-offs of Hollywood blockbusters with Grade C actors (think Steven Seagal and Chuck Norris) are common; it is less common for a virtual remake to feature stars like Harrison Ford and Glenn Close, and directors like Wolfgang Petersen. Air Force One does throw a few twists into the familiar mix, and immediately nudges the stupid-meter a few degrees to the right. 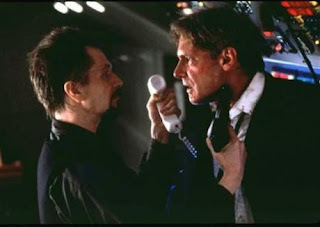 The action hero is none other than the President of the United States (Harrison Ford), and the wild-eyed terrorists, led by Gary Oldman, take over his plane, Air Force One, to force the release of a fascist general being held in a Russian prison. Getting past this premise is difficult enough, but we'll let it pass. Air Force One, despite the undisputed talent and polish on display, unfortunately insists on slobbering the absurdities in thick, gooey layers until the movie collapses into a helpless wreck, long before the plane itself expires. Air Force One and the President miraculously survive too-many-to-count should-be-fatal encounters with missiles, bullets, explosions, enemy jet fighters, and expiring engines, as reality is stretched deep into Roadrunner territory. Harrison Ford as the President has to deal with the moral dilemma of wanting to be tough with terrorists, but does this policy apply when guns are pointing at his wife and young daughter? Oldman, having fun as the Terrorist Nut Case, has bigger problems: he needs to avoid explaining why his band of terrorists decided to hijack the world's best defended target, rather than, say, storm the prison in Russia, which it would appear they were more than capable of, given that entire air bases in Russia appear to be loyal to them. And on the ground, Glenn Close has her own suitcase of trouble: she strains to appear Vice Presidential while holding things together at the White House surrounded by testosterone-fueled men as a succession of random staffers burst into the room holding a phone and announcing the latest news. At the end, the President is flying through air literally hanging by a thread behind a rescue plane. James Bond would be proud, but he would at least have a knowing smile on his face and a blonde with a martini awaiting his landing.